Christmas is upon us! From guiltless cookie consumption, to delicious food and cocktails, to tons of family time, there's a lot to be excited about during the Christmas season. But Christmas's nonstop shopping, never-ending food prep and, yup, family time, can make the holidays little bit stressful, as well. Because our cats are just like us, they feel the ups and downs of the holiday, too. Need proof? 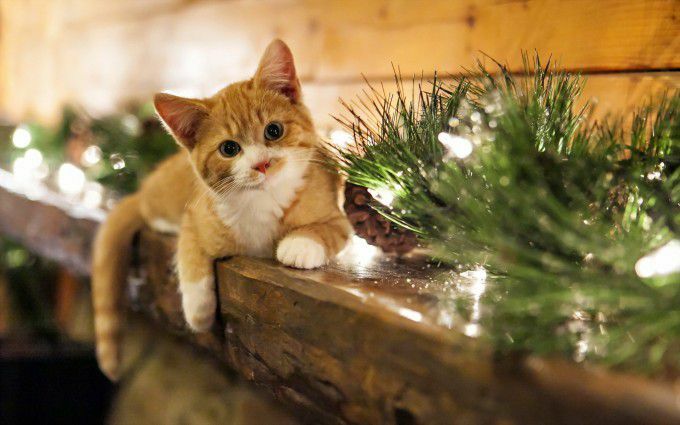 Check out these Christmas kitties celebrating the season. Digging through the massive piles of junk in your attic, looking for the Christmas decorations like, "We need to donate literally everything we own. Or just move into a new house and start over." Putting ornaments on a Christmas tree is truly an art form. Not only do your ornaments have to be perfectly spaced apart, but they have to pair well with each other (without feeling too matchy-matchy) and they can't compete with the lights or tree topper. That's why it's so important to inspect your tree from every. Single. Angle. There's nothing quite like cuddling up on the couch with a cozy blanket, some egg nog (or mulled wine! ), a plate full of Christmas cookies and your loved ones to watch your favorite Christmas movie, whether it's A Charlie Brown Christmas, Elf, A Christmas Carol or The Nightmare Before Christmas. Don't you feel all warm and fuzzy just thinking about it? From the impossible task of cutting in a straight line (just me? ), to folding crisp corners, wrapping gifts is really, really hard. But we all have that one friend who is ridiculously good at gift wrapping and has every single present wrapped up and ready to go weeks before Christmas Day. Of course, she likes to smugly show off her wrapping and time management skills whenever she gets the chance. Whenever it was your family's turn to host Christmas dinner, your mom probably started cleaning the house at least one week ahead of time, right? And during that week, when you dared to wear shoes in the house, drop a crumb or even step foot into the dining room, she probably gave you this very same, quasi-threatening look (Don't mess with Socks!). Christmas Day: When you and your sibling stampede down the stairs at 5:00 AM (disturbing everyone in the house) and see the glorious mountain of gifts under the Christmas tree. Do you ever absolutely crush all of the candy contents in your Christmas stocking, start to feel really sick and want to curl up inside of the empty stocking for a nap? Yep. Us too. This is how it feels when you start to realize just how much cooking you'll actually have to do before guests begin to arrive–and let's not forget clean up before and after dinner. Next year, just let your sister take the glory of hosting Christmas dinner. It's really not worth it. Your mom doesn't ask for much. Considering she carried you for months and months, birthed you and then spent 18 years (plus) years parenting you, you can put on a Santa hat for her once a year. Or a hideous Christmas sweater. Or even an outfit that matches your sibling's, *shudder*. That moment when your super cool, liberal cousin from California brings catnip to the family Christmas gathering and you have to pretend you're totally fine and 100% with it at the dinner table. Four glasses of egg nog? Check. Far too many servings of ham, mashed potatoes, casserole and gingerbread cookies? Check. Sweatpants donned? Check. Time to pass out on the couch in the warm glow of the Christmas tree... at 4:00 in the afternoon. We can't always get what we want–especially when distant relatives are shopping for us. When your Aunt Susan gave you something you really, really did not want for Christmas (every year), you probably played with it for a little while, so her feelings wouldn't be hurt... but then glared at it, like this kitty, whenever she wasn't looking.